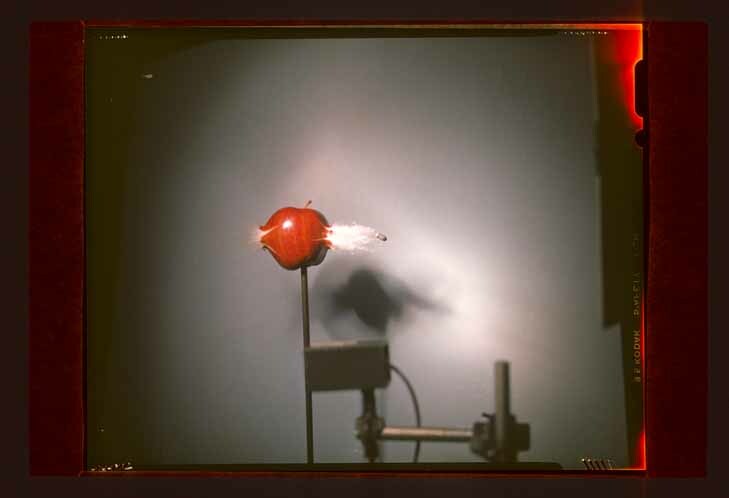 This startling image is one of a series of pictures that Edgerton took throughout his career of bullets being shot through apples. The most famous one (see HEE-NC-64002) was used to illustrate a lecture he gave in 1964 entitled "How to Make Applesauce at MIT." Moments after the apple is pierced by the .30 caliber bullet, it disintegrates completely. What is so surprising is that the entry of the supersonic bullet is as visually explosive as the exit. (see "Stopping Time" (1987), p.126) The duration of the flash in this photo is about 1/3 microseconds. The amount of light given off is small enough that the exposure must be made in total darkness. To trigger the flash at the proper moment, a microphone, placed a little before the apple, pickes up the sound from the rifle shot, relays it through an electronic delay circuit, and then fires the microflash. The careful lab preparation heightens the anticipation, but never quite matches the surprise and wonder that our eyes transmit to us, as we hold onto the after image in the dark. At that point, we know exactly what the flash illuminated and what the film, hopefully, recorded.